Hate your job? Ready to quit? Facing a layoff before you even have a chance to quit? Is your boss is a flaming jerk? Think you might have a lawsuit? If any of these scenarios apply to you, you are facing a crucial career moment. Mistakes and misinformation will cost you dearly. •I think they’re getting ready to lay me off. What can I do? •My boss is creating a hostile environment. Can I sue? •What does it mean if I sign a paper saying I’m an independent contractor and not an employee? •Am I exempt from overtime? 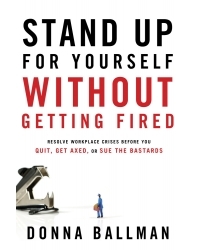 Whether you’re a recent college grad or an almost-retiree, newly employed or laid off after 20 years; gay or married with kids; janitor or CEO…Stand Up For Yourself Without Getting Fired will give you the specific and relevant advice you need to face any career-threatening situation…and come out ahead.